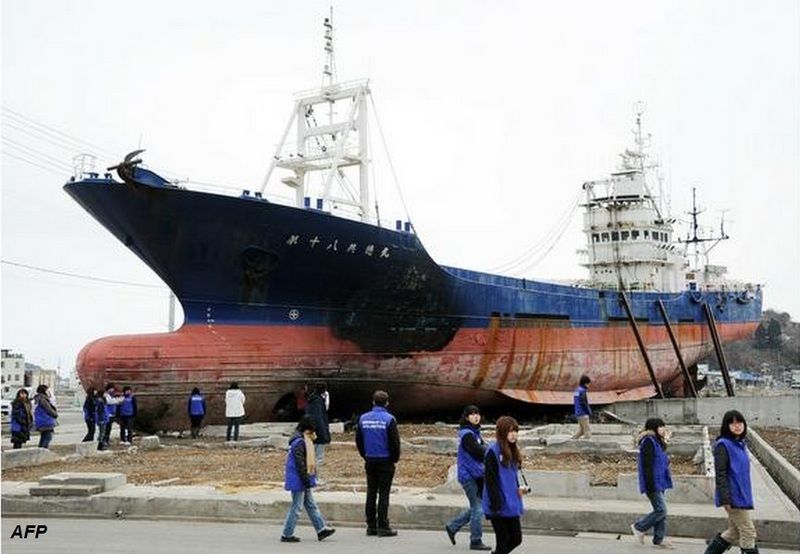 A Japanese town has decided to scrap a marooned fishing boat which has become a symbol of the devastating 2011 tsunami, officials say. Residents of Kesennuma in Miyagi prefecture voted to scrap the Kyotoku Maru No 18 – swept inland by a giant wave triggered by a strong earthquake. There had been plans to preserve the boat as a monument. The tsunami and earthquake on 11 March 2011 left more than 18,000 people dead or missing in Japan. The magnitude 9.0 quake, Japan’s most powerful since records began, also triggered a nuclear accident at the Fukushima Daiichi nuclear plant. The earthquake struck about 400km (250 miles) north-east of Tokyo. The tsunami it triggered hit the north-eastern coast of the main island of Honshu, sweeping away cars, ships and buildings, and crushing coastal communities. Kesennuma, with an estimated population of 70,000, was one of the hardest hit by the tsunami. After the disaster, people started visiting the marooned 60-metre (200-foot) boat to pray, take photographs and leave flowers. But last week, it was announced that the majority of the city residents had voted to have the ship broken up for scrap. “Our city has decided to demolish the vessel since nearly 70% of residents did not want to preserve it,” a local official was quoted by Agence-France Presse news agency as saying. City Mayor Shigeru Sugawara expressed disappointment that the boat, which he said was a “visible symbol of what happened here”, would be destroyed, but he said the decision had been made. The vessel may be taken apart in a few weeks, reports say. Kyodo news agency reports that a non-profit ship recycler has been contacted to dismantle the vessel, which is owned by fishing company Gisuke Gyogo in Fukushima prefecture.